As part of the tradition, a giant rainbow flag is displayed during Gay Pride Parades all over the word. 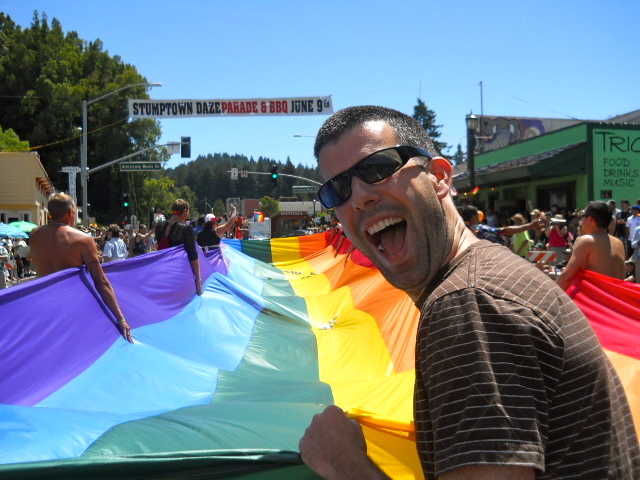 This one belongs to the Pride Parade in Guerneville, California, on June 3, 2012. The community at large honors Lesbian, Gay, Bisexual and Transgender members of our communities across the US. The June celebrations were kicked off by PRIDE in Guerneville, California, a small, close-knit community by the Russian River, surrounded by Redwoods. It is what I call a Treasure Town, and a must see! Next The California Primary: I Voted!